A station-front building convenient for your everyday life having a wide range of shops such as restaurants, fashion shops, teahouse and others providing miscellaneous goods, cosmetics, books and food. In the basement grocery department, we have a stock of fresh vegetables and fruits, fish, meat, prepared foods, a bakery etc. and we have popular annual events and special sales that are held every Friday during the "Friday Specials Market." At the restaurants on the fourth floor, you can enjoy a meals during your shopping. To top it all off, we also have the Mitaka City Gallery of Art on the fifth floor where elaborately planned exhibitions are held. ※This free service is limited to a maximum of 60 minutes per purchase. restaurant street on the fourth floor. ※We will NOT add together receipts between tenants. ※Receipts are only valid on the day of issue. does NOT provide this service. ※Please understand that some information may change depending on circumstances. Only 30 seconds from the south exit of JR Mitaka Station! Using the JR Chuou Line, it takes about 17 minutes from Shinjuku Station or 28 minutes from Tokyo Station to JR Mitaka Station. ※You can enter through the entrance on the second floor of Mitaka Coral that is straight from the south exit deck of JR Mitaka Station. 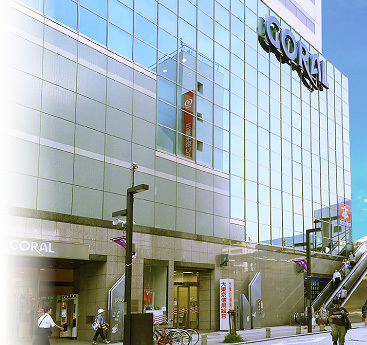 ※Only customers that shop, dine, or complete bank procedures at Mitaka Coral may use the parking lot. For those coming from Mitaka Ghibli Museum, it takes about 5 minutes to reach the bus stop in front of Mitaka Coral using the Mitaka City Bus . Mitaka Coral is convenient for dining and shopping. © MITAKA CORAL All Rights Reserved.